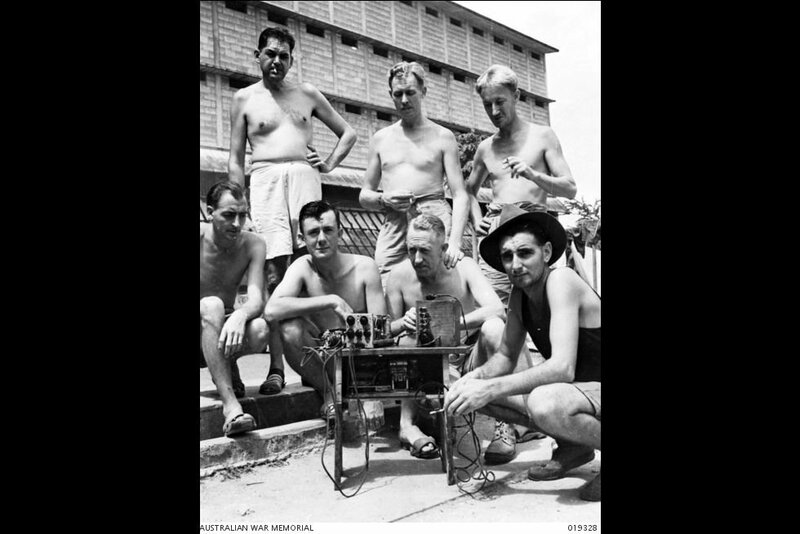 Released POWs crowd around two wireless sets made by Sid Sim (third from left) and Paddy Matthews (extreme right), who kept the sets hidden from the Japanese in a stool (as shown) and under a brick. Paddy Matthews stole out from the camp multiple times and broke into Japanese stores in order to secure the wireless parts as well as food and medical supplies for fellow POWs. Image taken circa 1945, courtesy of Australian War Memorial. The defendants, Tominaga Mosaburo and Nagata Takashige, were employed by the Iberaki Agency, which was concerned in intelligence and espionage activities. The Agency, which was under the control of the Imperial Japanese Army (IJA), operated under cover, and its agents were ostensibly ordinary civilians. The defendants held employment in the Japanese Steel Tube Company. The victim, Mohamed Khan, was an employee of the Japanese Steel Tube Company and a civilian resident from Singapore. Mohamed had apparently stolen bags of rice, medicine, secret documents, parts of a wireless transmitting set and personal belongs of Nagata. His motive was either to earn money to provide for his girlfriend, or to desert to Chinese communists, in view of the precarious position of the IJA during that period . Thereafter, the defendants brought Mohamed to a place in the jungle by train, where he was shot. The defendants admitted to have ordered and carried out the summary execution of Mohamed, although they contended that, in light of the Mohamed’s act of allegedly disclosing military secrets to the enemy, this was legally justifiable according to Japanese military law. Notably, the summary execution took place on 24 August 1945, more than a week after the announcement of the Japanese surrender on 15 August 1945. This was because the defendants had only learnt of the surrender on 27 or 28 August, a few days after the Mohamed’s execution. Tominaga, Mosaburo. Civilian. From Japan. Guilty. 10 years' imprisonment. Sentence confirmed. Nagata, Takashige. Civilian. From Japan. Guilty. 6 years' imprisonment. Sentence confirmed. McIlvenna, C.P. Major. From British military. Sheikh, A.B. Major. From British Indian Army. BA LLB. Takashi, Nakamura. Barrister of the Supreme Court Tokyo, Japan. Maynard, F. G. Captain. From British military.